How do you make sure you've nailed down the perfect 50 Adventures? Our workbook will help you brainstorm adventure ideas and narrow in on your 50. Use your poster to fill in all 50 of your chosen adventures. (Use pen to show you're committed!) Print the 8.5x11 poster yourself or buy a large, full color poster from us. Let's do this! 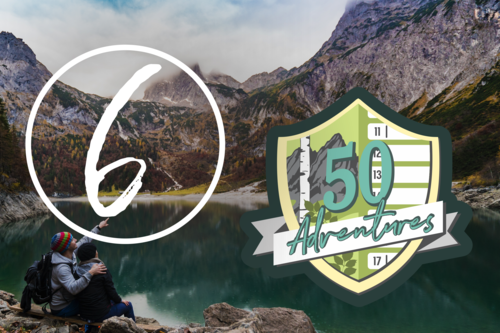 50 Adventures runs from January 1st, 2018 until January 1st, 2019. So many adventures, so little time... So get to it. Check off your adventures as you complete them. Share them with the community by using the tag #50Adventures. You want to make 2018 the BEST YEAR EVER! To help you stay on track, and fully appreciate this year, we'll send you a prompt each month to help you reflect. Use it as simple food for thought, or take it to the next level through journaling! You'll be emailed your 1st prompt in early January. Let's hang out! You'll be invited to join our 2018 50 Adventures Facebook Group, where you can share your progress all year long.